It's been a while since the last one and this are fun. So what do you want/speculate for the next version? Here's mine. Just to be clear, this is pure speculation just for fun, I don't expect most of any to happen but it would be cool if it did happen. Let's go with the obvious, new separate seal maybe with an earth god leader if the reward craft is anything to go by (seriously, why does the demon event gives a craft for earth gods? ), maybe a demon focused series going by the demon event (probably Halloween though). Going with that the series to pr would obviously be 72 Demons part one (extremely unlikely). And pr for some of the ultimate lords of that series! That means we could see the pr of the unsealed lord ultimate summoner companion, yes everyone pocket owl Glauox lord of the flip-floops! But I doubt we well get 72 Demons part one pr, after all (licensing issues aside with the Disney part of that seal) we still have diamond seal series to pr. Ignoring Sindhu and mechanical life because they aren't a year old yet, the next updated series is obviously the legendary heroes, the legendary heroic spirits, the Immortal Heroes and the Minds of the Fray! They don't necessarily need pr, just a wayto only occupy one slot would help them a lot. One way could be to permanently fuse them but that's boring and uninspired. So I propose the following, make a new dragon ware using mind of the Fray that's equipped by the corresponding immortal hero, this gives them the CD reduction of having both on the team and the ability to do the fusion, maybe even the skill of the Mind of the Fray before fusing. Dragon ware too steep of a cost? Fine maybe a new special evolution that requires the card to be all max first. You know we haven't had yet? The yearly Norse update so that would be cool. I have more ideas but I have to go now. 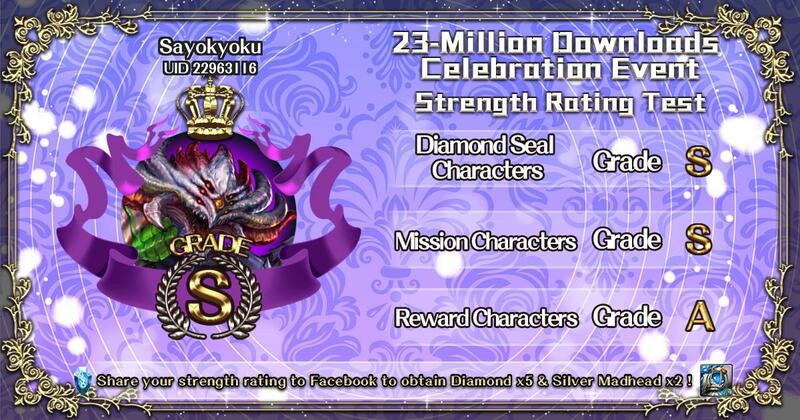 Share the image of your strength rating on Facebook for 5x Diamonds and 2x Silver MHs. Is there anyone who completed "Collect 20x Snow Sprite" Mission this week instead of last week and can tell me whether or not they got the Alpaca reward? Same for clearing Charon's Extra stage five times for a Harpie. The announcements say that this week's Special Mission of clearing "Showroom in the Forest" (IDK what this stage is) Extra five times lasts from 15/10 to 21/10, but the duration of last week's one is from 02/10 to 29/10. Are the collabs killing the the forum? I have played the game for a long time. Just got my 1750 day reward. I find myself playing less and less. Maybe I played too long. Maybe it became monotonous. But I noticed the forum is being used less and less. We use to have long discussions about the game. Nothing has been said here in a week. Sad to see the users disenfranchised by the game. Great game. Usually. New Horror stage arrives next Monday, September 24. Clearing Basic difficulty 5 times gets you one Ranto (slvl 5), and each clear of Horror difficulty drops 1 Withered Melog. - If the team contains a Human/God/Demon, enchant 15 random runes; if all three are present, enchant all runes. - If the team contains a Dragon/Beast/Elf, Team ATK 2x for 1 round; if all three are present, Team ATK 2.5x. - If the team contains a Machina, fully recover HP and ignore enemies' Defense for 1 round. A new Roger evolution will become available at 12pm on September 24. Evolution materials are 1 Roger, 1 Honeymon, 1 Sword and 2 Eternal Fire Spirits. One copy of Roger will be available for purchase from Arena, alongside the slvl 10 Rogers that are awarded at Sergeant 1 and Sergeant 3. Leader Skill: Human ATK 3.5x. When 6+ Water and Fire runes are dissolved, Human ATK 1.5x further. Water and Fire damage received -30%. Team skill: When Roger is a member and the team contains only Fire Humans, Roger's HP 2x. Active (CD5): For 1 turn, damage received -60% and this card cannot attack. Next turn, Fire and Human ATK 2x, and Fire damage can overpower Water enemies. Konosuba collaboration will be the focus of Version 16.1, which arrives in October. This collab is region-locked to Hong Kong, Macau, Taiwan, Singapore, Malaysia and Thailand only. The rare characters from the seal will be Megumin, Aqua and Darkness; their details will be revealed later. Team skill: When Kazuma is Leader and Ally, Earth ATK 9x. - Team ATK 1.8x for 1 turn. - Team ATK and REC 2x for 1 turn. Active (CD 6): Convert Dark to Enchanted Water, Light to Enchanted Fire, Heart to Enchanted Earth. For 1 turn, Self ATK on Demons 5x. Active (CD3): Convert 6 random runes to 3 Enchanted Fire and 3 Enchanted Heart (runes not of team member's attributes have priority). If the team contains Megumin, this can be activated again (maximum once per wave). Next version's Arena card revealed. Active (CD6): Convert the columns under 1 random Human and 1 random Demon into Enchanted Light; convert the columns under 1 random God and 1 random Elf into Enchanted Heart. Leader: When the team contains 3+ Attributes, Human and God ATK 5x. All members' damage on Light and Dark enemies 2x, and 1.5x on other Attributes (includes actives). Active (CD7): Convert the top and bottom rows to Enchanted Fire. Deal 8 million Fire damage to all enemies (ignores defense and enchanted shields). At the end of the turn, this card enters Fatigue for one turn. Active (CD7, only usable when DC is full and cannot activate DC that turn): Convert odd rows into Enchanted Fire. Deal 10 million Fire damage to all enemies (ignores defense and enchanted shields). At the end of the turn, this card enters Fatigue for two turns, while non-Megumin Humans and Gods enter Excitement for two turns. When used as member in Dual Aqua: All other runes have Fire effect. Leader: Water and Konosuba series cards ATK 5x. If 5+ initial combos are made, ATK 1.3x. Runes will only dissolve in the initial batch. Active 1 (CD8): For 1 turn, initial dissolve can trigger for groups of 2. If more than 25 runes are in the initial dissolve, next turn convert all runes randomly into 5 attributes. Active 2 (CD7): Remove all added effects. For 1 turn, team damage on Demons and Machinas 3x. - All runes have Water effect. - 15 second spin time. - Runes touched while spinning become enchanted. - When 5+ types of runes are dissolved, damage received -87%. - Team contains Megumin or Yunyun: All runes have Fire effect. - Team contains Kazuma or Chris: All runes have Earth effect. - Team contains Darkness: All runes have Light effect. - Team contains Wiz: All runes have Dark effect. When used in a team with Mitsurugi: Mitsurugi's active changes to "Select and explode 1 type of rune to generate runes not of that type. If added effects are in play, Team ATK 2.5x". Leader: When the team contains only Humans, Human HP and ATK 1.5x, while Light Human HP and ATK 2x. Every time you are attacked by an enemy, Human ATK increases by a further amount, up to 6x. If no attacks are received for 2 turns in a row, ATK will decrease. Active (CD8): Heart drop rate becomes 0 and is transferred to Light instead. Damage received -15%; every time an enemy attack is received, reduction effect +10%, up to -35% reduction. Lasts until death or reactivation. This skill can be deactivated at any time to convert 8 random runes to Heart. When used as Leader + Ally, Light and Heart have 50% effect of each other. When used as member in Dual Aqua: All other runes have Light effect. Konosuba seal draw series will have its own Candigon-type feeders. Next week's SM is Vanir. Boss A skill: Lock all actives + attacks and mask all runes if the team contains Gods. Initial Dark combos = no damage and extra attacks from him. Ignores control skills. Boss B skill: Left and right columns are lasered. If the team contains Humans, touching the lasered runes will kill you. While his HP is 40% or more, the next damage will not kill him; if he reaches 1 HP, he will fully recover HP and ATK increases to 2x. Ignores control skills. Leader: Dark ATK 3x. Damage on Humans 2x. Active (CD6): Convert 6 runes to Dark Demon runes (non-Dark, non-Heart runes have priority). Deal 80,000 Fire damage to one enemy, regardless of defense. 3: For 1 turn, damage received will not kill you. The legendary Pisces outfit will be up for sale in Arena! Next biweekly is Lizard Runners (Konosuba exclusive). Active (CD6): Explode Light and Dark runes to generate enchanted runes. For 2 turns, after moving runes, Light and Dark rune drop rate is halved, and gets transferred to Hearts instead. 3 new Machina cards are getting added to Friend Point seal. Active (CD6): For 1 turn, Light, Dark and Heart runes have 50% effect of Water, Fire and Earth. If Fuel is 50%+ on activation, the effect increases to 100%. Active (CD6): Explode the lowest row of runes 3 times successively. For 1 turn, Self ATK 3.5x. Active (CD6): For 1 turn, this card launches 3 chaser attacks of random attributes. If 3+ attributes are dissolved, Team ATK 2x and recover 6,000 HP. These three components can fuse into a new Machina card. Active 1 (CD6): For 1 turn, this card launches 1 chaser attack of a random attribute at 2x damage for every group of Water/Fire/Earth runes in the initial dissolve. Recover 3,000 HP for each group of Light/Dark runes in the initial dissolve. Active 2 (CD8): Explode the bottom 2 rows of runes 3 times successively, dealing colorless damage to all enemies and generating enchanted runes. For 1 turn, all attributes have the effect of Water, Fire and Earth. There's going to be a promo campaign between TOS and COMEBUY tea stores; the highest rewards are an ALL MAX Mesopotamia, iPhone X 64G and a Nintendo Switch. More details at http://www.toscampaign.com/comebuy. Next week's SM (September 21) is Indra. Active (CD6): Convert 7 fixed positions into Light God runes. For 1 turn, the highest damage dealt by Gods or Demons becomes the damage dealt by all Gods and Demons. The Chinese Beasts (Schemas) are getting an alternate Machina PR path, starting 4pm September 17 (Mon). The PR materials are 2 Egg Watchman, 1 Power Core, 1 Honeymon and 1 Eternal Spirit. Leader: When the team contains only Machinas and Dragons, Team ATK 4.5x and +300 ATK for each member. When 3+ runes are dissolved in a Machina's column, that card's ATK 1.5x. Active (CD5): Convert the columns of 2 random Machinas to Enchanted Water. If Leader and Ally are Machinas, then Leader and Ally ATK 2.5x for 1 turn. Leader: Machina and Beast REC 3x. When Hearts are dissolved, recover 5% of Machina+Beasts' total HP. Active (CD6): Cut self HP to 1. For 1 turn, every column of 5+ runes in the initial dissolve will generate 4 Enchanted Fire runes. If 2 or more columns of 5+ runes are dissolved, fully recover HP. Leader: Machina and Beast HP 3x. After receiving attack damage from an enemy, deal 5x Machina+Beast's total HP in colorless damage to all enemies before launching attacks the next turn (runes must be dissolved). Active (CD6): Convert 5 random runes to Enchanted Heart (Light and Dark have priority). For 1 turn, Hearts have 50% Earth effect; for each other Machina in the team, this effect increases by 50%, to a max of 300% with 6 Machinas. Leader: When the team contains only Machinas and Beasts, Team ATK 5x. Runes of the leader's attribute have 50% effect of all attributes (can stack). When 5+ combos are made, Machina Fuel +5%. When all Machinas are at 100% Fuel, Self ATK 2x. Active (CD6): For 1 turn, Beast and Machina ATK 1.5x. Ignore 80% of enemies' Defense. If this card's Fuel is at 100%, ATK increases to 2x and ignore 100% of enemies' Defense. Active (CD6): Convert Light and Heart to Enchanted Heart; Convert Water and Dark to Enchanted Dark. If HP is 1 upon activation, then for 1 turn Self ATK increases by 2000 (cannot stack). The next area of the 10th Seal, Ritual Ruins, opens at 4pm September 17 (Mon). Dragons and Elves are prevented from entering this section. Zana, the elven composer of "Whisper of Monesis", is the boss of this area. Similar to the Warzone Remains, you must collect Tunestones from the Ritual Ruins in order to unlock the next area, the Eternal Prison. Upon the release of the Ritual Ruins, the Trade Fortress will also open up trades to exchange Tunestones of specific types and amounts for Silver Patterns, Silver Seals and Yummy Alpacas. Finally, next week also sees the return of Riddles in the Moonlight! Challenge the stage a specified number of times to get rewards, but with the restriction that any monsters used (Leader, Member or Ally) will be blacklisted and cannot enter again. You can reset the blacklist and accumulated clear amounts at any time. A Medea summer outfit is the reward for 10 clears. Other rewards include PR materials, Harpies and a title. New Black card debuts next Monday, and lasts all week (September 10 to 16). Every 40 draws guarantees one Mesopotamia. The 10-draw option becomes available again, with one Yummy Alpaca free with every 10-draw. Ancient Coin seal also returns during that time. - Earth ATK 4x and Earth Human ATK 5x. - Extend spin time by 2.5s regardlessly. - When 4+ Combos are made, this card launches an extra Light and Dark attack. - When 6+ Combos are made, this card's ATK 3x. - When 8+ combos are made, this card's damage ignores specific initial combo shields. - Effect persists until you don't dissolve 4+ combos. - Leader's leader skill gains the effect [Light and Dark can be dissolved in groups of 2]. - Light and Dark runes have 50% effect of Earth and Heart. - Leader and Ally's initial CD -5. We're also getting one free Diamond Seal draw daily from logging in on September 10 to 16. If you're lucky you might draw Mesopotamia through this! New Coliseum event, featuring Kubera. Enemy skill: If the team contains cards from the Hindu Gods series, then Gods' CDs become 0 and God ATK 2x for 7 turns. Every turn, one random runetype is converted to Light runes; if Light runes are in the initial dissolve, damage dealt to the enemy becomes recovery instead. Hindu Gods and VR Babylons (both forms) will give 20% extra points when used in the team. 15 successful clears nets you a Shiva animated outfit. - Damage received -50% (-80%). - Leader and Ally ATK 2x (3.5x). If the team contains Only Gods, values in brackets apply instead. New Survivor of Oroz weekly card, Ziz. Active (CD8): Turn runes in Beasts' columns into Beast runes. For 1 turn, Beast members launch one Light chaser attack at 2.5x damage. If I activate Y'golonac followed by Shire, it guarantees that the bottom row will be light runes (Y'golonac's effects), followed by a top row of water runes (Shire's effect). The best part? Since bottom row is all light runes, Shire's 2.5 additional multiplier is guaranteed. Y'golonac has a 5 CD cooldown, while Shire has 6. But a 6 CD combination of 2.5 multiplier with 2 types of attacking runes (Light and Water) for Yusuke team isn't too shabby right? P/S Y'golonac gives Yusuke a sniping effect as well. Anyone trying this as well? Fun fact: Shire is an executioner while Y'golonac has no head, so they go well together I guess? It will feature a series of new mobs, the Dim Sum Ladies. Each one gives 50k EXP when fed to a card; but if you feed all five different ones together, it becomes a total of 1.5m EXP instead. Chang'Xi and Chang'E will feature as the raid cards, giving 200 points and having 100% drop rate. Active (CD 8): For 3 turns, when HP is not full, recover HP based on the number of Humans in the team, up to 15,000 HP with 6 Humans. 200 personal points gets you a Sariel outfit, and 1,000 personal points gets you a SLVL 10 Hou Yi. Leader: [ATR] ATK 4.5x. For each column of 4+ runes in the initial dissolve, 1 [ATR] God rune will be generated in that column. Active (CD 10): 10 second time tunnel. For 1 turn, by dissolving a group of 6+ [ATR] runes, [ATR] ATK 2x. - For each column of 5+ runes in the initial dissolve, 2 [ATR] runes are generated in that column. - When 2+ columns of 4+ runes are in the initial dissolve, Team ATK increases, up to 1.5x. Leader: [ATR] ATK 3.5x. For each row of 3+ runes in the initial dissolve, 1 [ATR] God rune will be generated. Active (CD5): Explode self column to generate Enchanted [ATR] and Enchanted Heart runes. If adjacent members are [ATR] Gods, explode their columns likewise. VR will be made available on August 27 (Monday) at 4pm. For each Babylons' outfit you own, you will receive 1,000 souls back, as well as the corresponding outfit for the Refined form. Active (CD6): For 1 turn, the higher Team HP, the more Machina ATK and Fuel increases, up to 2.2x and 40% with 40,000 HP.